Born and brought up in Hull, Liam Mower was selected for the lead in the musical Billy Elliot after the producers conducted a nationwide search in 2003 for three boys to share the lead role in the musical. He combined starring in the musical in the West End for 18 months with studies at the Royal Ballet School and the Northern Academy of Performing Arts. 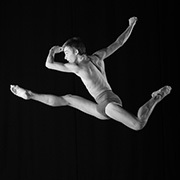 After moving back to Hull to complete his GCSEs, Liam returned to London in 2008 to study at Rambert School. After graduating with a first-class honours degree in July 2011, Liam joined Matthew Bourne’s New Adventures and has recently performed in Edward Scissorhands and as the lead in Swan Lake, yet again echoing the path taken by Billy Elliot.